I grow tired of ham real fast, so I usually buy a small one, and we try to devise dishes that will use it up quickly. 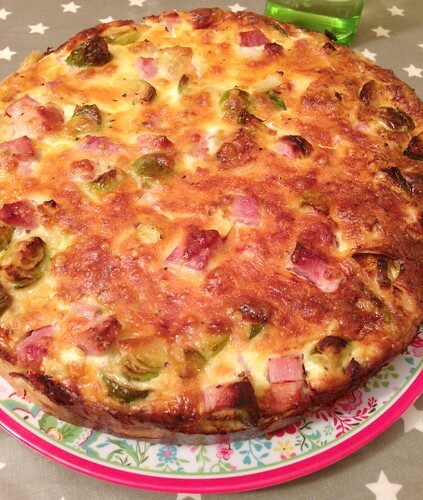 Tonight, I also happened to have a bag of brussel sprouts - we both like them a lot, but I couldn't think of a dish with just sprouts that I wanted... but paired with the ham, in a quiche? Perfect. My mom makes a great quiche, and this is pretty much her recipe. I used a little more cream than milk, while she does half/half, and I think she adds even more water to her crust but I thought that sounded too scary so I chickened out. This worked out well. Very, very well. Start by making the pastry. In a food processor, combine flour, butter and water. Whiz until the mixture first gets crumbly, then turns into a ball. Shape into a log, wrap in plastic and leave in the fridge for at least half an hour. Slice the log into 1/2-cm slices, and press out into a pie tin. (I use a 24 cm springform pan.) Blind bake for 10 minutes at 175°C. Meanwhile, get on with your filling. Fry the sprouts and onion in a little butter for about five minutes or so. Add the ham. When the pie shell has baked for ten minutes, add the sprouts, ham and onion to it, and top with the cheese-and-egg mixture. Bake for an additional 25-30 minutes. It should be golden brown and feel "set" if you jiggle it.